Unabated heat wave continues with the “Queen of Hills” recording the hottest day of the season today as the mercury soared to 30.6°C, the highest temperature this season. Chief Minister PK Dhumal has requested Union Minister for Rural Transport and Highways Kamal Nath to sanction another national highway (NH) connecting Shimla with the industrial area of Nalagarh-Baddi-Barotiwala and further Ropar in Punjab. The 75th birth anniversary of Union Minister for Steel Virbhadra Singh turned out to be a memorable one with the local Municipal Corporation hosting a civic reception in his honour. Congressmen also took the opportunity to celebrate his induction in the Union Cabinet. The Rahul brigade, comprising youth Congress activists, specially got prepared a 75-pound cake for the occasion. A Bharat Sanchar Nigam Limited (BSNL) procurement godown was razed to the ground in a massive fire that erupted around 12:15 pm today at Fashkana village on the Solan-Shilli link road, about 9 km from here. Two youths are losing their sleep over a woman named Sapna as both claim her to be their wife. However, Sapna decided to go with her parents when she was presented in the court of Sub-Divisional Magistrate Sumit Khimta by the police yesterday at Ghumarwin, near here. Unregulated traffic in Dharamsala is leading to accidents and frequent traffic jams. In an accident today on the civil lines road, a Santro car was hit by an HRTC bus. The car, due to the impact, landed in a house on the road breaking the boundary wall. Fortunately, none was hurt. Chief Minister PK Dhumal said his government always had a dream of making every citizen of Himachal Pradesh self-reliant. He said this today at Toani Devi during the concluding function of Hem Raj Memorial State Basketball Championship. While midway breakdowns of the Himachal Road Transport Corporation (HRTC) buses have turnout to be a nightmare for passengers travelling in them, it has also become a cause of concern for the staff plying these buses. Lt-Gen TK Sapru, GOC-in-C, Western Command, visited Yol military station and other satellite stations today. He also met all senior officers of the Rising Star Corps and carried out high-level consultations with commanders to review operational preparedness. The Army today conducted a major disaster-management exercise called “Mountain Rescue” as part of their preparedness in evacuation of civil population at the Annadale ground. Rabid dog scare has once again started haunting the residents of the district. Yesterday, in Panchrukhi area of the district, a rabid dog bit about 25 locals. All persons are now exposed to rabies infection. Having undergone an exhaustive restoration and conservation work at a cost of Rs 11.48 crore, the historic Gaiety Theatre is all set for a grand opening after a gap of five years. World Bank-assisted bio-carbon project, first of its kind in Asia, is likely to be pruned significantly with the Centre changing the definition of forest under the clean development mechanism (CDM). In a bizarre incident, chief trustee and priest of the Durga temple at Shalaghat, located on the NH-22, near Kandaghat, allegedly shot himself in a bid to commit suicide around 10:30 pm last night. The incident also left temple’s secretary Vijay Thakur injured as he received splinter bullet injuries on left shoulder and above the navel. The 24-hour chain fast by the Chamera stage-II oustees in support of their demands here in front of the office of the Deputy Commissioner has entered its fourth day today. General secretary of the Chamera stage-II Oustees’ Welfare Samiti Dharam Pal said residents of Karian Mohal, near Chamba, whose land had been acquired for construction activities of the Chamera project stage-II had been given a raw deal while giving compensation and jobs to them in 1988. The state forest officers association and the forest rangers association have urged the government to enhance the financial powers of the assistant conservator of forests (ACF) and re-designate the post after nine and 14 years of service. Following a complaint of Meena Kumari of Sthana village, the Indora police arrested her husband and three members of his family yesterday for allegedly harassing and assaulting her. Massive shifting sands and extensive silt in the flooded Sutlej river had forced the ACC cement factory at Barmana, near here, to stop its production for at least 12 hours. This resulted in loss worth lakhs of rupees. Three Panipat-based persons were nabbed at Shwar near Ani in this district on Monday with 2 kg of charas and one-and-a-half kg opium. The culprits were identified as Ramesh, Satpal and Kuldeep. They were carrying the contraband in an Indica car and were on their way to Chandigarh. The scorching heat has taken a toll on fruit and other crops but for the tourism industry, it has been a very good season with tourists thronging the hill state to beat the heat. With rains being deficient by almost 53 per cent this season, bad news is that the much-awaited monsoons will be delayed by almost 10 days. “The mercury had touched 29.4°C on May 19 last month, which was the highest temperature this year but today, the temperature of 30.6°C is the maximum for this season,” said Manmohan Singh, director of the local Meteorological Centre. He said the record for the hottest day in Shimla was on June 20, 2007, when the temperature was recorded at 31.5° C. The record for the second hottest day was on June 10 when the temperature was 31.4°C. He said heat wave was likely to continue for the next few days before the arrival of the monsoons, which would bring the temperatures down. “Normally, the monsoons hit Himachal by June 20 but is seems that this time they will be delayed by at least 10 days,” he said. For the next one week, there was practically no possibility of rain, he added. It was in 1992 that the monsoons had been delayed unusually as they hit the state on July 16. The temperatures in other parts of the state have also been soaring with Sundernagar touching 40.9°C, Una--43.8°C, Kalpa-- 26.0°C and Dharamsala-- 36.6°C. Mercifully, with the water supply situation in the state capital remaining better than previous years, tourists are arriving here in huge numbers to beat the heat of the plains. Finding a hotel room either in the Himachal Pradesh Tourism Development Corporation (HPTDC)- owned or private hotels is a difficult task as all units are booked to capacity. Tourists are also making a beeline to the tribal districts of Kinnaur and Lahaul Spiti, which are less crowded. Even other tourist destinations — Kullu-Manali, Dalhousie, Kasauli and Dharamsala — are seeing a huge influx of tourists. In a letter written to Kamal Nath, he said the 106.40-km state highway No 6, originating from Shimla and passing through Jubbarhatti (Shimla airport)-Kunihar-Ramshehar-Nalagarh upto Ghanauli (Ropar in Punjab), should also be declared as a national highway. The Chief Minister said the Sansari Nallah-Killar Thirot (SKT) road, which fell in the tribal district of Lahaul-Spiti bordering China, was being maintained by the Border Roads Organisation. He said this road was of strategic importance and an important alternative road for the border areas in Jammu and Kashmir. The road was situated in the most inhospitable and difficult terrain and continued to be strategically important in view of the sensitive position in Jammu and Kashmir border areas, he added. Dhumal said this road was transferred to the state government on October 17, 2007, with a clear understanding that the entire expenditure on its maintenance incurred by the state would be reimbursed by the Centre. He said the state had already conveyed its views that Himachal, with its very limited resources, was not in a position to provide 50 per cent of its share for maintenance of this road and had requested the ministry to allow the expenditure to be met out of the Strategic Roads Funds in line with the decision conveyed. The 75th birth anniversary of Union Minister for Steel Virbhadra Singh turned out to be a memorable one with the local Municipal Corporation hosting a civic reception in his honour. Congressmen also took the opportunity to celebrate his induction in the Union Cabinet. The Rahul brigade, comprising youth Congress activists, specially got prepared a 75-pound cake for the occasion. The celebrations started right from the morning as people from all walks of life thronged Holy Lodge, his private residence, to greet him. Those from rural areas came dressed in traditional costumes and danced to the beat of folk instruments. Pradesh Congress Committee Chief, MLAs and other party leaders were part of the celebrations. Mayor Narinder Kataria recalled the contribution of Virbhadra Singh in the development of the state. Speaking at the reception, Virbhadra Singh underlined the need for planned growth of the city for which the state government should take effective steps. MANDI: The Rajiv Ekta Manch today celebrated the 75th birthday of Virbhadra Singh with the children of Suda Mohala, here today. Copies, pencils and sweets were distributed among children and other people who participated in the festivity. According to Tarun Pathak, spokesperson of the manch, Push Raj, former president, Mandi municipal council, and Rajinder Mohan, general secretary, SC, ST, participated in the event. A loss of Rs 4 crore has been estimated in the fire, which took place due to smoldering pine forests surrounding the godown. 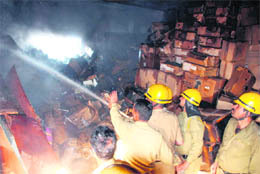 Though the two security guards deputed there did alert BSNL officials about the blazing pine needles in the precincts of the godown, little could be done to control it, as a sudden gush of wind led the fire to spread uncontrollably in an area of 300-400 m within a minute. However, the place had been cleansed of the inflammable pine needles a few days back, but this did not deter the fire from spreading. DGM Gurbaksh Singh said as per preliminary estimate a loss of Rs 4 crore had been calculated, though the actual figures would be worked out later. While enlisting the losses, a BSNL official said costly equipment, including 150-km length of PLB pipes, 70-80 km length of cables, several 1,000-1,500 amperes batteries, etc, had been engulfed in the fire, which was controlled around 5 pm. The sorry state of affairs was, however, manifested from the inept fire fighting as two fire tenders would douse fire and then go back for refilling leaving a period of more than half-an-hour within which the fire would resurface. The BSNL officials, including GM Ashwani Salwan, the DGM and others who reached the spot, also sought help from the administration for more fire tenders. An official, however, rued that though they were assured of more fire tenders from Parwanoo and Shimla at 1 pm, but it was only at 4:30 pm that a lone fire tender was made available from Shimla. The godown spread over an area of 1,400-1,500 sq m on the valley side of the road continued to smolder with fire for hours together and as all inflammable material was stacked inside and the fire took minutes to spread. Villagers of the Salogra panchayat also helped in controlling the fire. The godown served the Solan secondary switching area comprising the twin districts of Solan and Sirmaur. Earlier, Duni Chand of Doohk Mannan village, near Barthin, had registered an FIR at the Talai police station that his daughter Sapna was missing since June 13. Later, Dalbir Singh of Salwaad village in the Kot Dhar area also registered an FIR saying that his wife Sapna, who married him on June 1 according to Hindu rituals, was missing from his house since June 10. On June 21, Sapna surprised everybody at the police station as she arrived dressed as a bride with Yash Paul of Barthin. He also claimed to be her husband as they married at Banjar in Kullu district on June 19. The police was faced with a piquant situation as both youths claimed to be her husband, but Sapna confirmed that she had married Yash Paul on June 19. On the other hand, Dalbir Singh and his relatives claimed that she married him on June 1. The police decided to present Sapna in the court of the SDM who asked Sapna about her preferences. Sapna one again surprised everybody when she said that she would go with her parents, leaving both the youths disappointed and guessing. However, it illustrated the risk being posed to life and limb of those travelling on main roads of the town. After the accident, police officials went in a frenzy of clearing the vehicles parked on the roadside. However, the administration has failed to address the basic necessity of lack of parking space in the area. As per the norms of the country and town planning, any commercial building should have a parking space. However, most of the commercial buildings in the area do not have any parking space. The result is that most of the workers coming to commercial building park their vehicles on roads leading to traffic congestion in the entire area. However, the long term solution of traffic problem being faced by the area can only be solved by creating a permanent parking place or by enforcing the strict building norms in the area and forcing owners of commercial buildings to create parking space. “While providing education, good roads and health facilities in the state are the priorities of the government, we have a dream of making every person self-reliant so that he can lead a life of self-respect,” the Chief Minister said. Education Minister ID Dhiman also addressed the gathering on this occasion along with MLAs Baldev Sharma and Urmil Thakur. Earlier, the Chief Minister also laid the foundation stone of the science block of Senior Secondary School, Toani Devi, and school rooms at Primary School, Samirpur. There are reports that many a time the HRTC buses plying on long routes gives up in the midway, not only leaving the passengers high and dry but causing problems for the staff deployed on these buses. According to the HRTC staff, the main reason for the breakdown is that most of the buses are quite old and do not get required wear and tear after the long journeys. Earlier this month, some formations under the Western Command carried out certain field exercises to validate operational concepts and test their equipment after which Chief of Army Staff reviewed results of a high-level war game held at Chandimandir. GOC-in-C, Western Command, as a follow-up measure, interacted with Corps Commander, Rising Star Corps, and will also witness demonstration of training proficiency of a few formations of the corps. During the course of the visit at Yol GOC-in-C went around the cantonment and inspected the station facilities and interacted with jawans and families to enquire about their welfare. The basic aim of the exercise was to practice evacuation of the civilian population from the disaster-affected areas in the mountainous terrains of Himachal. Army Aviation Corps and Air Force helicopters practiced casualty evacuation drills in conjunction with the Army’s special forces and regular troops of 7/11 and 1 Naga. The exercise was conducted in conjunction with the civil administration and the fire services department. Sources in the area said, fortunately, there was no “A” category bite (in which a person is bitten in upper parts of the body). In such cases anti-rabies serum that contains live anti-bodies has to be administered to the patient within 24 hours. In the recent past, three persons had died in Sidhbari area near Dharamsala due to “A” category bites by rabid dogs. The heath authorities failed to provide them serum in time. They were just administered common anti-rabies vaccine that contained passive anti-bodies to create active immunity in human body. Availability of anti-rabies serum is still a problem in the district. It is available only at Tanda Medical College. Meanwhile, the district health authorities, when contacted, said they had started the first intra-dermal animal bite clinic in the district. It was formally inaugurated yesterday by Dr HK Vashisht, SMO, Palampur, by vaccinating a child bitten by a rabid stray dog. He said this new technique had brought down the cost of the vaccination from Rs 1,600 to about Rs 400 which is within the reach of a poor person. Dr RK Sood from the CMO office and a team from the health department, Dharamsala, trained the local staff in this new technique. On the first day, six persons availed of the facility and three were referred to Medical College, Kangra. The Gaiety Theatre, where renowned names like KL Saigal, Prithvi Raj Kapoor, Madan Puri, Shashi Kapoor, Jennifer Kapoor, Anupam Kher and Manmohan Singh have performed will be thrown open for theatre and other cultural activities on June 25. The 120-year-old Gothic style heritage structure was designed by Henry Irwin and was opened in 1887, but its formal opening took place in 1888. It remained the hub of cultural activities since the British days. The restoration work has been undertaken under the guidance of a Mumbai-based architect, Ved Segan. Besides the old theatre, the restored structure has a bigger multipurpose hall with a capacity of 400 persons. There is the old theatre with a capacity of 138 on ground floor, 180 on the second floor and the Art Gallery of the Lalit Kala Academy. The new facilities that have been added after restoration include a multi-purpose hall, gallery, conference hall and a museum. The restoration project with an initial estimated cost of Rs 5.13 crore went up to Rs 11.48 crore on completion. The restoration work has been done as per traditional conservation norms along with application of modern conservation method. World Bank has asked the Forest Department to review and revise the project in light of the new definition, as per which a patch of 500 sq m or more with woody growth of more than 2 m height and 15 per cent density will constitute a forest. The project was formulated on the basis of earlier definition under which growth of 5 m height or more and 30 per cent density was covered. Originally, about 10,000 hectare of non-arable and degraded forest land was to be brought under plantation over the next three years. The department is working overtime to revise the project, a ticklish exercise which requires identification of all patches of 500 sq m or more with woody growth of more than 2 m height for exclusion from the original project. After exclusion these areas will take shape of holes in the original satellite imagery-based mapping. Forest Minister JP Nadda said the area to be covered under the project might come down to around 8,000 hectares, though a clear picture would emerge after completion of the exercise. World Bank had appreciated the project and there were no objections. The revision had been warranted due to change in definition of forest. The progress of the project would be monitored through satellite images and as such basing the project on the prescribed format was most important. Under the project, the beneficiaries will receive Rs 4,000 to Rs 6,000 per hectare annually, depending on the carbon credit market. The idea of the project was to provide cash incentive to resource-starved poor farmers to encourage them to raise plantations. The Forest Department has identified 25 species, including fruit and medicinal plants like mango and fig, which not only have a good capacity of carbon sequestration but also help in regulating the hydrological cycle. The purchase of carbon credits will be in addition to the Rs 365 crore which World Bank is providing for the Mid-Himalayan Watershed Project. According to Additional SP Mahinder Thakur, who visited the spot, Vijay Thakur had gone to oversee some preparations for the next day when he heard bullet shots from the priest’s room. A case of attempt to suicide and arms act had been registered against the priest. Representatives of the associations met Forest Minister JP Nadda here today and discussed the demands with him. They urged him to designate the post of the ACF as deputy conservator of forests and conservator of forests (state cadre) after nine and 14 years of service, respectively. The also demanded mobile phone allowance and better communication facilities to forest rangers to enable them to discharge their duties more efficiently and effectively. Nadda assured them that their demands would be considered sympathetically and said a three-member committee would be constituted to review the state forest cadre. Reports said the water supply of the factory was totally crippled and its pump house, which lifts water from the Sutlej river at Rambagh, near Dehar, could not function at all for about 12 hours as the heavy silt in the water forced the river to change its course. The factory management at once swung into action and deployed its men and machine power at the site to restore the water current, but it took 12 hours before the water lifting could be restarted. They were produced in a judicial court on Tuesday and remanded in police custody for three days.